We are a casual-upscale fine dining restaurant and wine bar in the heart of Union Square San Francisco. Our philosophy is simple: to offer hand-crafted, quality food with fresh, local ingredients complemented with a premium, boutique all-California wine list – all served affordably with professional service in a charming, lively environment. First Crush is a bi-level restaurant and wine bar in the heart of busy downtown San Francisco. At First Crush we offer hand-crafted New American California cuisine with boutique all California wines. Our casual and up-scale environment makes it a great place to host special events and private dining. 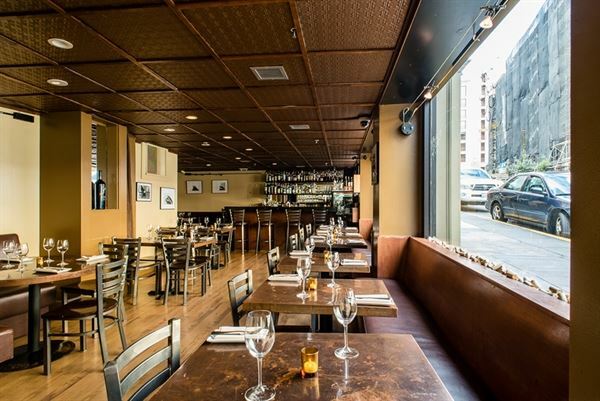 We offer private rooms, semi-private rooms, street-level dining, and full buyouts. Our private and semi-private rooms are located in our wine cellar were you can choose to seat 75 guests or do a standing reception of up to 200 guests. Street-level dining is another option here at First Crush which is great for food and wine receptions. Street-level dinging is able to accommodate up to 50 guests, seated and standing. If a full buyout is something you are looking for, this consists of a bi-level dining experience. Including both the wine cellar and street level dining room, allowing you to host up to 200 guests. With the full buyout, you are provided with a wine tasting bar, private dining room, and multiple lounge areas in addition to several intimate corners and wine tastings. For dining, we offer 3 separate meal packages, a hors d'oeuvres option, and beverage packages. Meal options include three courses starting at $55 per person.